For the makers of one of the top operating systems, being in an ever-changing and highly competitive industry means that innovations and improvements have to keep on going. And keep on going they do. Powering up its latest operating system, Windows 7, with fresh additions and feature revamps, Windows takes another step towards a smarter, more user-friendly and more attractive OS. 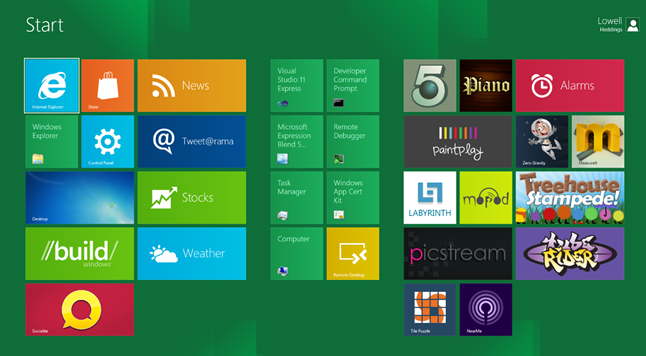 Windows 8 starts with discarding the round Start button while still keeping the Metro-style Start Up screen, which has five patterns and nine background colors to choose from. Consumer Preview is updated, especially the look of the Developer Preview. Switching between applications gets more fun with more ways and effects, and there are readied changes for networking, power management, security, file copying, hardware support and many other features. Windows 8 also introduces the first real Metro apps and the Windows Store for those wanting to use third party apps from real app developers. Applicable only for x86/64 PCs, the Windows 8 Consumer Preview takes its features a notch higher, as installation becomes easier with enabled direct download and installation from the web page. You will no longer have to download an ISO file and burn it to a disc to be able to install. Most tools and interface will be practically unchanged, but performance and battery life are improved. 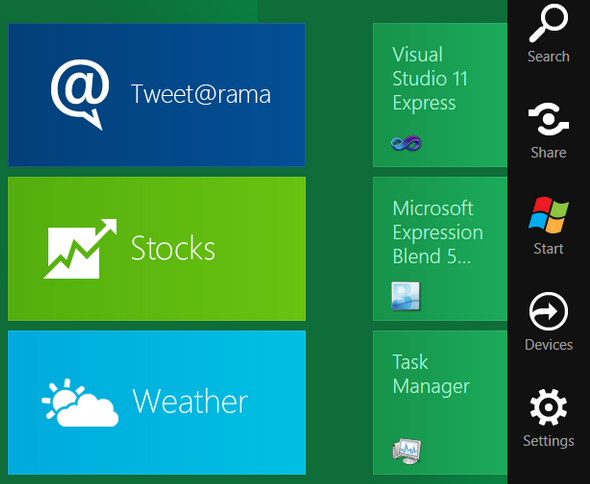 While the Metro interface looks pretty much the same, its functions and features are all powered up. Users can already pin Explorer and their photos, notes, appointments, email, libraries and friends to the interface. They can also enjoy enhanced touch gestures, a new Metro tile for the desktop, and a fresh new look for the charm bar, Start, Share, Devices, Search and Settings. Navigation and playing with items and folders become more fun and convenient with the new enabled effects and motion capabilities. Swiping and scrolling through the mouse are speeded up, Semantic zoom is enabled, and dragging actions are upped with further functions such as in creating new groups for files, opening new apps and putting apps into the vertical pane of thumbnails. The resizeable touch keyboard also has an improved layout, with automatic spelling corrections and predictive text for faster typing. The letters are divided into the two sides of the screen, easily reachable by both thumbs. A numeric keyboard has been added in the middle for easier PIN or password entry. Included in the Consumer Preview for easy access are basic app needs: email, messaging, calendar, contacts, social networking, photos and an app to access SkyDrive. Other available apps are Bing Map apps, music and video catalogues by Zune, weather apps, finance apps and a gaming section branded by X-box–all labeled as previews. As they’re not yet the final apps to be made available for Windows 8, they offer similar experience but far less features. As should be expected of a newer version, Windows 8 addresses consumer complaints on Windows 7 and plays up on its strongest points. However, it also removes the Start menu that Windows users had been accustomed to from its earliest versions. But if you try hovering the mouse over the familiar left hand corner, you will be able to see an array of running Metro apps as thumbnails and switch to another running app. You can access your most used desktop tools (such as the Task Manager, Search, Run, Explorer, Control Panel, Device Manager, Disk Manager, Power Options and Event Viewer) by right-clicking the same left-hand corner and opening the menu. There are also more ways to switch from one app or folder to another, so you can go and choose at least one that works best for you. The desktop still has the built-in apps that users have always known: Notepad, Wordpad, Paint, Control Panel, Windows Media Player and Media Center, Sticky Notes, and many others. The ribbon reveals hidden Explorer features and offers context-sensitive functions to save the trouble of going to the Control Panel to do them. Signing up with Windows Live and connecting it to your social networking accounts (Facebook, Twitter, LinkedIn and Flickr) allows you to manage your various account in one convenient go. You automatically get your messages, contacts and calendar, and your content from your social network accounts are automatically redirected to your Windows Live page (Facebook and Flickr photos go to the Photos app, Facebook friends go to the People App, and so on). Overall, the Consumer Preview offers a big and definitely welcome improvement from the Developer Preview. It fixes the first’s glitches, enhances its strong points, and makes the experience far smoother and more enjoyable. Issues such as low battery life and frequent crashes have been addressed, and performance is made a lot better. 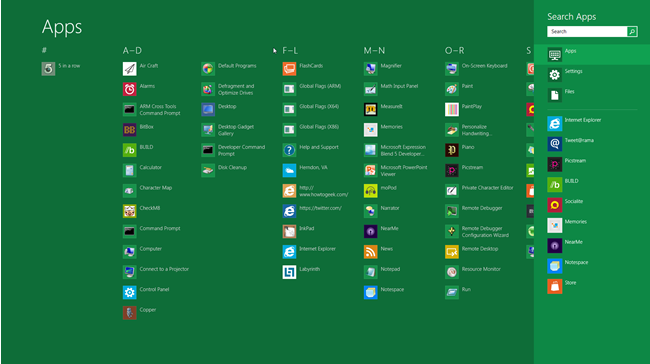 Touch or mouse, Windows 8 is user-friendly. In general, it is definitely one to look forward to.